Over the past several years, I have steadily been improving my diet and eating healthier foods. The first thing I did was cut out all processed foods from my diet. I went through my entire kitchen and boxed up all the processed food I could find. The next day, I took the food I collected and donated it to the local food cupboard. I replaced all of the processed foods with healthier choices. One of those choices was Quinoa. I love it! Quinoa (pronounced /ki:nwa/) is a grain-like crop grown for its edible seeds. It originates in the Andean region of Ecuador, Bolivia, Colombia and Peru. Quinoa seeds contain essential amino acids like lysine and quantities of calcium, phosphorus and iron. It is considered superfood with a very high protein content. It is a good source of dietary fiber, and it's gluten-free. 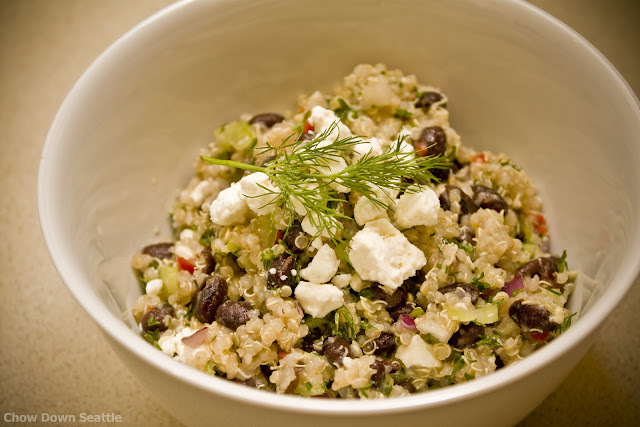 One of my favorite recipes is for Quinoa Salad. This salad includes black beans, celery, red onion, and feta cheese. The one thing I really like is the spicy herb dressing for this salad. It includes garlic, dill, a jalapeno red chili, lemon and cilantro. I have made this salad several times already, and it makes a great side dish to any healthy meal. I hope you enjoy the recipe. For the spicy herb dressing, process cilantro, jalapeno red chili, dill, and garlic to a course paste. Slowly add the extra virgin olive oil and lemon juice to the spicy herb dressing. Mix until well combined, and then transfer to a bowl. Cover the bowl and refrigerate until needed. Place the quinoa in a saucepan and add 2 cups of cold water. Bring to a boil over medium heat, reduce and simmer for 15 minutes. Drain and transfer to a large bowl. Add the black beans, celery, red onion, and Feta cheese. Add the spicy herb dressing and mix well. Serve and enjoy!